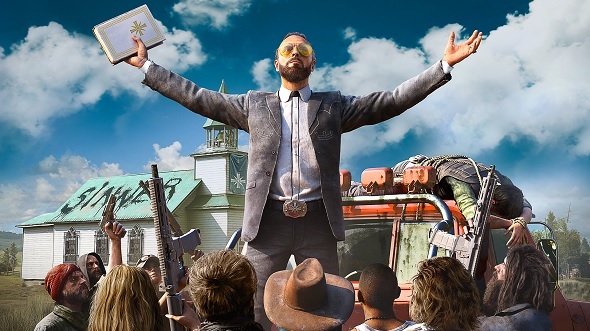 Never has a game told you not to play it as emphatically as Far Cry 5. In an introductory sequence stuffed as full with foreboding as the Peggies’ silos are with fuel, everybody tells you to go home. 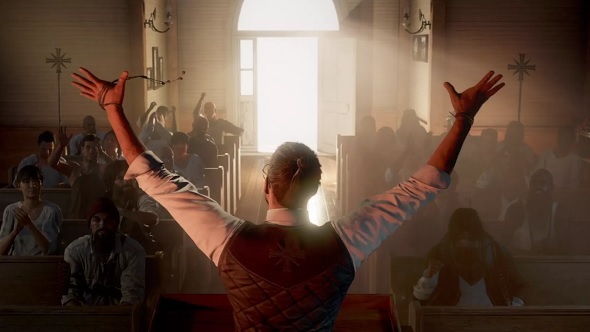 The federal warrant brandished by a US marshal, your reason for being in Hope County, looks very much like a mere piece of paper – especially under the gaze of a statue in the style of Christ the Redeemer that depicts the cult leader you’re after, Joseph Seed. Looking for more open world shootery, and perhaps a game that doesn’t try to drive you out of town, these are the best sandbox games on PC. Gleeful violence has always been at the core of Far Cry but its messaging on the subject has been more ambivalent. Far Cry 2 analysed the brutality of the arms trade in a divided nation and how, within that, people strive to make profit from suffering. Far Cry 3 looked at colonisation and the impact of violence on young people. Far Cry 4 put civil war and military dictatorships under the magnifying glass. All of these games explore the ugly aftermath of violence, hence the savage nature of their worlds. Bullets puncture flesh and must be wrenched out with pliers, animal skins are sliced from their bodies with the aid of a ten-inch blade, and characters snarl their murderous instructions to you through gritted teeth. Throughout, there’s been a sense that you’ve left the map in a worse state than you found it. Take Far Cry 4, for example: after winning all those outposts through force, Pagan Min is willing to abandon Kyrat of his own accord, leaving you standing in his palace. You haven’t deposed a dictator – you’ve replaced one. 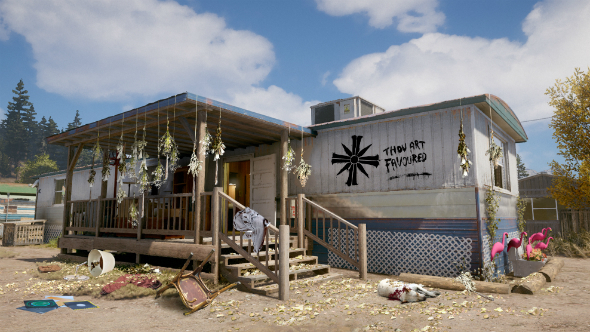 If the Far Cry series as a whole is about the problem with intervention, then Far Cry 5 is specifically about US separatism. Before your arrival, Seed has devised a doctrine designed to feed on his congregation’s fears of government interference and loss of personal freedoms. It’s a potent concoction. In the 1980s, Vicki and Randy Weaver moved their family to the mountains of northern Idaho after recurrent dreams about an imminent apocalypse. There, the Weavers lived in relative isolation to escape what they believed was a corrupted world. That was until 1992, when US marshals – pursuing a warrant for Randy Weaver after his failure to appear in court over firearms charges – were spotted surveilling the property by the family dog. In the ensuing shootout, the dog, a deputy marshal, and the Weavers’ 14-year-old son were killed. A siege followed – during which Vicki Weaver was shot dead by FBI snipers. The siege at Ruby Ridge became a symbol of separatist resistance and injustice at the hands of federal government. Timothy McVeigh, one of the two domestic terrorists who killed 168 people and injured more than 680 others in the Oklahoma City bombing, made a pilgrimage to the Weavers’ cabin. McVeigh visited the site of the Waco siege, too, where David Koresh and 75 other Branch Davidians died in fire and shooting after a botched warrant attempt. The large, distinctive spectacles that Joseph Seed wears will be familiar to anybody who has seen photos of Koresh, who believed himself to be a prophet destined for martyrdom. 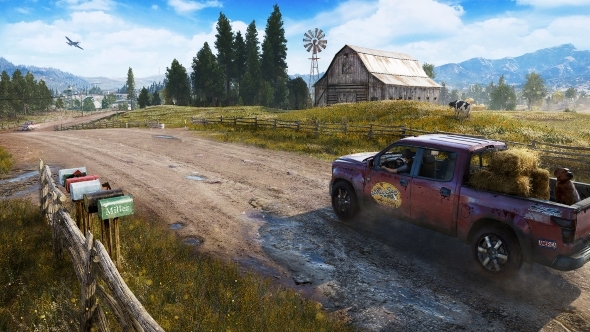 The arrest attempt not only fails chaotically in a fiery helicopter crash – it heralds the Great Collapse that Seed has prophesied, and triggers the spate of kidnappings and murders that make Hope County such a violent place to travel around thereafter. As Marshal Burke is pulled from the river by Peggies, he invokes the power of the state, enunciating every word: “I am a United. States. Federal. Marshal.” It’s the worst thing he could possibly say. Far Cry 5 doesn’t only demonise separatists. Even the good guys in Hope Valley, the non-cultists, believe the world is about to come down around their heads. Dutch, your saviour, lives in a bunker filled with tinned goods. Over the course of the game, you top up your supplies from the stashes of preppers. The apocalypse they prepared for has arrived, in the form of the Peggies, and you’re reaping the rewards of their forward planning. And of course, you can join them – taking the advice of the wise moustache. Fail to cuff The Father for long enough, and the sheriff gently pushes down on the top of Seed’s arms, de-escalating the standoff. “I will have you all arrested,” Burke fumes, his words echoing emptily around the church.